Ancestors on any of the old ship’s lists as yet but there are only a very few free records on the internet for us to study. And I have tons of links below where my notes and documents are preserved for others to peruse and see if they connect to us. Named after my great grandmother Lorena Bozeman McClain who was born in 1890 Ramer, Montgomery, Alabama, I have thoroughly enjoyed writing about this great lady and her heritage. After my parents passed away and my husband died of cancer, I began to write about them and their family trees when I was unable to sleep. Our families have traveled many miles and intertwined in the same communities, some knowing each other, many moons ago. 2........................Enter the maize of genealogy. With so many families in former Creek Nation Alabama, it is quite possible we are mixed. Researching our Cochran and Carter family ancestors, I made a small introduction page to get us started ! I do have a ton of research to share with my family and will try to get it organized for easier navigation. James Edgar Brooks married Susie Mae Cooper and then their son James Jr married Mary Ella Thornton. John Brooks, a tailor by trade, married Roxanna Permilia Smith in Tennessee about 1860; John came from Pennsylvania and his father was from Holland and his mother was from France. John's son, John, married Annie Clark Ballard in Tennessee and they moved into Alabama and are buried at Greenwood Cemetery. Cooper, Levi Benjamin married Sarah Elizabeth "Sallie" Carter in 1884 in Montgomery AL and his family came from Chambers County Alabama. Sarah Cooper is buried by Annie Ballard as they both were widowed and living with James Brooks in the Montgomery census records. And of course we never traced the adoptive father of Cecil Earl Fenn Carter, and do not know if they were relatives of this Sarah Carter. Charner P. Cooper of South Carolina married Sara F. Lee in 1845 Chambers AL and had Levi Benjamin Cooper who married Sarah Elizabeth Carter. Elija Lee of South Carolina married Malinda Phillips about 1830 in Greene County GA and the moved into Chambers County near the Coopers. There are several families listed on the census with these surnames so perhaps many came to Alabama by wagon train and settled there, as the Creek Indians began to give up their lands. Chambers County was once Creek Indian Territory. John Wise Carter came from South Carolina to Talledega Alabama which is named for a Creek Indian Village. William M Craig married Rebecca Carolina Pennington in 1860 in Tennessee. which is rich with several indian tribe's history. North Carolina had several indian tribes and still has a Cherokee Indian Reservation that my daughter has visited; it has a wealth of information for genealogists. These families are all living close together on the census records. This author is reminded of a story told about one ancestor who married an indian woman and gave her a Biblical name. History tells us that once the woman was baptised, she was given and English name. Of course if the groom joined her tribe, he could have received an Indian name or the mixed blood children received both, such as Chief Red Eagle who was really named William Weatherford who's family migrated from Virginia to Montgomery Alabama. Within my many unorganized webpages to follow, I have posted the census images and other documents recorded to prove this genealogy. Some relatives I knew personally, shared letters and phone calls with, and I have also been reading many old cards and letters from my family to document names, dates, and locations, but also ordering death certificates to prove even more. We have found the grave and headstone of Lacy's father, Jesse Bozeman born 1793, in Montgomery County Alabama and Jesse's brother William Henry Bozeman had Jesse listed as the administrator of his will and estate sale, as found in the archives building. 1910 Elmore Co, AL, Central - pct 6, page 92, ED 76, sht 2A........................................................... (all birthplaces shown as AL) Willie Thornton 37 M1 farmer, married 17 yrs,shown as Wm J in 1900 Sallie (wife) 30 M1 married 17 yrs, 7 kids, 6 living, shown as Sallie E. in 1900 Elijah (son) 16 laborer-home farm Mary (dau) 13 Judain? May (dau) 10 Earnest (son) 8 Early (son) 6 Jewell (dau) 3........................................................... W. J. Thornton married C. S. A. E. Woodall on Nov 9, 1893 in Elmore Co, AL ....................................................................................................................................... 1930 Montgomery Co, AL, Pole Bridge, ED 51 sht 7B (all birthplaces shown as AL) Milton Thornton 36 auto mechanic, married 14 yrs Bessie (wife) 30 married 14 yrs Loraine (dau) 10 Nellie (dau) 9 James (son) 7 Mary Ella (dau) 3 Glennie? Mae (dau) 0 mos ............................................................................................................. There is a draft registration for Milton Thornton in Elmore Co dated 6/5/1917. Milton's birthdate is shown as 5/11/1894. He is married and working for the Lancaster-Johnson Lumber Co near Wetumpka................................................................................ There is a family tree for Milton and Bessie at rootsweb. Shows their children but not their parents...................................... Milton died on either 12/1/1953 or 12/4/1953 in Montgomery Co. DC # 25766. Looks like another death certificate needs to be ordered for confirmation...................................................................................................... >>>>>1900 Elmore Co, AL, Cold Springs, ED 63, sht 13B >>>>>(all birthplaces shown as Alabama) >>>>>L. W. Hood 41 farmer married 14 yrs >>>>>Ella O. (wife) 29 married 14 yrs, 3 kids, 3 living >>>>>Sewart (son) 10 farm laborer >>>>>Minnie Lee (dau) 8 >>>>>Allen W. (son) 2 ...............................................................................................................................................................................................................................Then we find John Brooke born 1837 in Holland but raised in Pennsylvania, with his father, Hans Brooke, from Holland and mother from France..........................................Hans had three boys and one girl..................Henry, Edward, John and Lula Christine....They settled in Reading PA. The parents died leaving minor children, and the little girl was adopted.........John, our grandfather, was bound out to a tailor to learn that trade.........He was very unhappy and ran away, arriving in Columbia TN about 1860 and we find him on the Giles County 1860 census in TN working as a tailor but as John Brooks............That year he married Roxanna Permilia Smith. She was just breaking up with her other boyfriend, Doctor Smith and fell in love with John Brooks.................John and RP had Walter and Nora before joining a wagon train to Texas where John, Lula, Nimrod and Tom were born..................John died in 1882 of tuberculosis and is buried in Paris TX. Roxanna went back to TN to marry Doctor Terry Crittendon Smith. He actually heard she was widowed and went to Texas to marry her and bring her back to TN. They lived and died in Sandy Hook, Tennessee. wife of John, mother of James; the daughter of Eudora Craig and James Ballard of Lawrence TN plus her four grandparents were all born in Tennessee. Greenwood Cemetery, behind the Last Supper monument; all the way to the back road of the cemetery. son of Mary Ella Thornton and James Edgar Brooks; buried in Millbrook Alabama at Brookside Memorial. Little, Laura Simmons Hawes daughter of Lucius Powhatan Little studied indian blood line possibly from her father's own stories. Smith, Benoni could be related, he was surety to marriage of grandma Catherine Weatherford, as listed in #76 in the article. never be able to prove that our Charles went to Alabama and married Sehoy in the Creek Nation but this author believes he did. Charles and his family were banned from the state of Georgia but Charlies died in GA and this author believes that his daughter's name was Catherine Georgia Weatherford. our Native American ancestry, yet knowing it is in my heart and in my spirit, is all that is really important. The stories consist of one great granny who was a well known healer in Dublin, Alabama; one who could read the ashes after smoking her pipe; one aunt born with a veil over her face ( which was removed three times) which was the sign of a seer. The amazing intuition of my father, who left work immediately when it thundered, knowing that his baby was about to be born, and yes, I was born that day, in Broken Arrow, Tulsa, Oklahoma. spoke the English language, yet practiced good survival skills. I would love to learn more about their culture and language, and teach our children to respect these and the ways of our elders. Yet we have the stories to pass on and the love, truth and respect that were taught to me. When Indians learned about Christianity, they welcomed new knowledge of GOD and the afterlife with their elders. They were in awe, learning of Jesus, and of course we were told the Mormons believe that Jesus appeared to the Old America, so perhaps this faith was quite welcomed by most the tribes when the Europeans arrived. So when they were Baptized, many were given new names to use and they are almost impossible to trace now. Some Indians changed their name more than once during their lifetime. Our Stephens line in 1760 married an unknown full blood Cherokee woman in NC and gave her a Biblical Name. Due to Indian unrest and the Trail of Tears, many Eastern Band Cherokee fled south or up into the mountains (OverHill) to escape the laws and disease of the white man. Our family believes that Charles Weatherford "may" have fathered our Kitty Weatherford in Virgina before moving to Alabama and fathering Chief Red Eagle. We also might connect our Cochran, Little, Wright lines to Cleopatra, sister of Pocahontas. Many of this line came from South Carolina and Virginia into Tennesee and Kentucky before moving to the Midwest. Mother's line in Virginia, North Carolina, South Carolina came into Alabama for quite some time before some moved west. Census takers were very prejudiced and would not recognize Indians owning property so they put most down as blacks or mulatto - in some cases the Indian feared the government finding them so they called them selves blacks or whites. After the Trail of Tears, they believed that no Indians existed in other areas, so no Indians appeared on census records, and had to be found on the Indian Nation Rolls in Oklahoma. Thus we hope to find our ancestors registered on the Indian Rolls, somehow, but it sure seems to be an endless journey. A Western Pioneer! Some researchers think his mother's line intermarried with native americans. grandson of Jonas Little...does the name Lucius appear often in this line? perhaps Jonas's ancestry has a Lucius in it. John Stephens took a North Carolina Cherokee full blood wife and gave her a Biblical name and they fled to Alabama....some went to Florida and into Panama becoming the Banana People of today. Beautiful granny died so young. In labor wanting to call her mother for help, he pushed her down the stairs and she lived only a few hours after giving birth to William. Both her parents have native american ancestry and strong spiritual lives. So who is Preston ORR who owns these plots? Mulatto Families in NC 1880-Are they Yours? George & Jonas Little possibly brothers? think about it? notes from the LDS site, Rootsweb, and census records. Alabama Bozeman families found on many census records, married to Dillard, Gibson, McClain. Census records allowed only black or white as race, sometimes mulatto if they weren't sure, but you never see Red or Native American. Grandpa Frank D Cochran married Luella Ellen Coonfield and had my father Frankie Lavern Cochran. Great Grandpa Benjamin Wallace Coonfield married Lattie Cedonia Little in 1891. Lattie’s father was John Wright Little of the Civil War. John’s pension papers are included in these works. The Coonfield family came from Holland to Pennsylvania and settled in Kentucky by 1800. Cochran came from Scotland to Pennsylvania and settled in Ohio. Most of these are later found in Arkansas and Kansas. John Wright Little told his family that they were of Cherokee blood, claiming to be white. He is buried on some unknown mountain in Marble, Arkansas. of Doctor Hiram Lucius Little and Nancy Catherine Wright. Crigler and Mary Catherine Roby. several more children, including Hiram L Little Jr.
achieved and suffered by those who came to Kentucky as the red man departed. Their very names are being blotted out from the memories and records of men. Deserving a better fate than this the name of George Little is here set down. guinea's stamp: A ma's a man for a ' that. result of this he went to his grave a cripple. The ball was never extracted. families they turned their backs on civilization and their old home in S. C.
and started on their journey. view of ultimate settlement. They separated to go to their respective homes. Atterbury of Daviess Co., She survived her third husband several years. Justice of the Peace in all this region. George Little made his will. He left the bulk of his small estate to his wife. Abstracts of wills & inventories, Daviess County, Ky.- Cont'd. Capt. of Patriot Service Prisoner at Charleston South Carolina on May 12, 1780. Crigler and Mary Catherine Roby. John's daughter Lattie Cedonia Little Coonfield is my great grandmother. Lattie married Benjamin Coonfield and they had my grandma Luella Coonfield Cochran. Dad talked of her having dark brown eyes and long black hair that she could sit on. It is told that John's wife died in Kentucky and he moved on to Arkansas, and is buried somewhere on a mountain top in Marble, Arkansas. He told his children they were native americans and needed to move, and be white if they wanted good jobs and land. His daughter Lattie said she was halfblood Cherokee. A ma's a man for a ' that. membership the side of the Atlantic. * Other son of Jonas was Douglas Little who married Martha Ann Wright, another daughter of John and Catherine Wright. In fact on the 1850 and 1860 census, Martha's parents are living in her house. One son of Douglas and Martha Little was called Powhatan who wrote much about their ancestry and named most of his children accordingly. Powhatan's daughter, Laura, was researching Cleopatra, another child of the famous Indian Chief Powhatan and our native american blood. *Other daughter of Lattie Little Coonfield was Amy Marie, who married Joseph Gray and their child, Dorlene, was researching the indian blood in the Little family. Family lore is that the Coonfields were also indian blood. *Photo of Ruth Coonfield, another daughter of Lattie. Captain George Little of Scotland and Mary of Scotland had a son named Jonas. Jonas Little married his step sister Betsy Douglas, daughter of Alexander and Mary Douglas. George married Mary Douglas after both had become widowed. Jonas and Betsy had a son named Hiram Lucius Little and another named Douglas Little. Hiram and Douglas both married Wright sisters; Hiram to Catherine and Douglas to Martha, daughters of Catherine G Weatherford and John C Wright of Charlotte VA. The Littles and Wrights had both moved into Bullitt Kentucky and all suspected of having Indian Blood according to the stories passed on plus some letters written by other Little family members. Douglas and Martha Little had a son named Lucius Powhatan Little and he was researching Chief Powhatan of VA. Hiram and Catherine had John Wright Little and he told his children that he was Indian. John's daughter Lattie Cedonia Little Coonfield said that she was Cherokee. Lattie's daughter Luella Coonfield Cochran said that she was one quarter Cherokee and mixed with another tribe. Luella's son Frankie Lavern Cochran also married an indian, Anne Carter. My webpages includes copies of letters and census images to help us with this continued research. However, let's keep in mind the many others included in our genealogy, like Catherine Crigler, Reason Roby, Kitty Simmons, Lydia Carpenter who explored this new country among the indians who taught them how to survive. 27 Sally m 1813 William Featherstone d/o William Vaughan. Sur. 53 Winifred m. 1798 William Lunderman d/o Zedekiah Vaughan. 53 Sarah m. 1784 Perry Mahon d/o "Abraham Vaughan"
76 Mildred m. 1789 Benoi Smith d/o "Abraham Vaughan" by Rev. Tucker m. #1 d/o John Johns. member to Kitty Weatherford, to give surety to her marriage to John C Wright. Perhaps the unknown mother of Kitty was a Polly Jones of the Thomas Jones families of Bermuda Hundred in Henrico VA and have some connection to a Smith or a Vaughn. We can only wonder when reading the census image below what happened for Martha Ann Wright Little to take in the children of her two sisters and her mother is also living with them. Martha even raised John Wright Little who said that he was Cherokee Indian according to his daughter Lattie Cedonia Little and her daughter Luella said that she was one quarter Cherokee mixed with another tribe. Luella Coonfield married Frank Delbert Cochran. Martha named her first son Powhatan and she was a native of Charlotte Virginia. Other family members have suspected Indian Blood in the Wright family, but also in the Little family. The photo of John Wright Little's wife is awesome, Mary Catherine Crigler. Catherine G Weatherford, daughter of Charles, married John C Wright in Charlotte, Virginia on January 5, 1811. Benoni Smith was sur to m them. Benoni Smith was married to a Vaughan. The connection with Smith, Vaughn, Weatherford, Wright is unknown. The search for the correct CHARLES WEATHERFORD continues. There were many Weatherfords in Charlotte, Lunenburg, Mecklenburg areas and many could have named their son Charles, as we also find several Catherines. Family suspects the father of Chief Red Eagle, was also our Charles Weatherford before he made the trip to Alabama from Virginia. ***Parents of John C Wright are Thomas and Esther which we are now tracing. Note: Note: She was full blooded Cherokee Indian. She married a white manin Western North Carolina, went to the Cherokee camp near inwhat is now Lincoln County, TN, then on the trail of tears toArkansas. Note: Note: Thomas Vaughan of North Carolina was a pioneer settler onWhite's Creek in this county, and afterwards settled onGragston, where he died. In his younger days, he was a famousfiddler, and after his conversion became a prominent minister ofthe Baptist Church. He raised a large family and died loved andmourned by all who knew him. Isaac Benjamin Coonfield born 1780 Pennsylvania married Barsheba Clark in Kentucky and they are found on the 1800 tax list. Moses B. Coonfield in Pennsylvania might have been his brother. Gideon and Oliver Confield were in New York about that time. Yet Isaac never used these names when his sons were born, unless Moses B was a Benjamin. Isaac's father might be Robert J. Confeld so he could be Robert James. It is speculated that Christopher Confeldt is Isaac's grandfather from Holland but we never see that name used in his descendents, yet we do not know what his middle name might have been. It is possible that Christopher had several sons and these names are all related - the old census records do not show their ages, so again it is possible some of these names are sons of Robert. believe that archelus clark was archibald and maybe her brother, maybe obediah was her brother too , all living near each other. //To get better results, add Birth or Death Information. Take a guess if you're not sure. Entrance to Cochran pages are here where the Coonfield and Cochran marriage began in Arkansas. Jacob Benjamin Cochran came from Scotland to Pennsylvania to Ohio to Iowa to Kansas and the Coonfield came from Holland to Pennsylvania to Kentucky to Arkansas. John Wright Little left Kentucky and settled in Arkansas where his daughter married Benjamin Wallace Coonfield. This author still wants to learn about the 1790 census showing all those Little families living so close together, seeming like brothers. George, Jonas, John, Joseph, William, Thomas + our George named his sons by those same names. The census images are endless as we continue to follow their trail through time. Hi dear cousin Wonda and Aunt Berneice and my wonderful family! I've been writing down all of our thoughts and family stories passed down, scanning old and new photographs, collecting census images back to 1790 and putting them on webpages to preserve them all. I have also been printing them and saving a large notebook for the children to browse through someday, if they do get curious about their family heritage. Of course it is really not very organized because I might find something new on the Cochrans, then suddenly find something new on my mother's lineage or my husband's, like just yesterday I received a new package of photos of his great grandparents from a cousin on the internet and was so excited ! 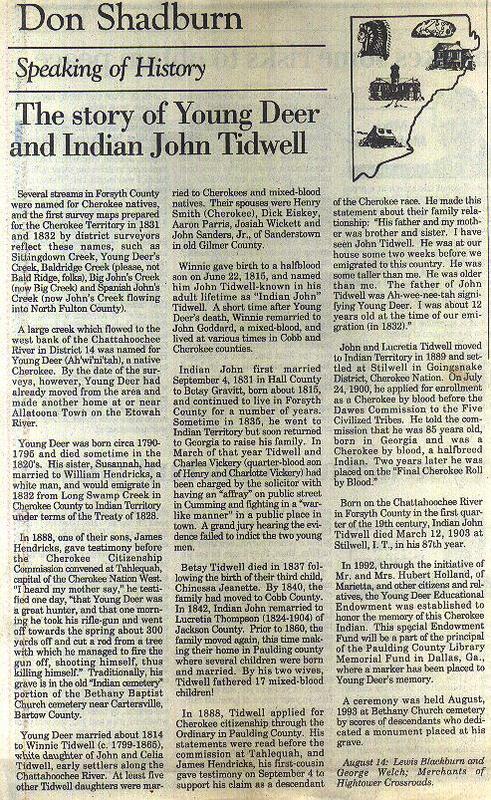 Mother's Cherokee blood relatives came through Georgia long before the Trail of Tears but not very much is documented from it, just the family lore. Nice knowing that our granny Luella Cochran told her children that they were Cherokee. When I read over the old letters from Laura Little, that her daughter Martha, sent me, I do feel that she was trying to connect her family to another daughter of Chief Powhatan thru his daughter, Cleopatra, and of course the chief probably had hundreds of children that have never been researched - but because Lucius Powhatan Little told her to work on it - surely she had a reason. Lucius also wrote many letters researching cousins in the Carolinas and I think back to where I discovered a Jonas, John and Joseph Little in the Revolutionary War living close to Captain George Little, so I suspect his whole family came over from Scotland, because he named his sons the same. Some of the other Littles were here in Alabama and one even attended my mother's Grandpa McClain 's funeral. USgenweb.com had an interesting page about the many Kentucky tribes existing during the time our dark skinned Scottish Little families were there, so they all blended very well and claimed to be white, so the government would leave them alone and not force them into Oklahoma. Anyway, I am trying to save all of this information on a CD for your computer and perhaps someone would someday finish up our research and appreciate the years of hard work we have all put into it. Thank you all so very much for your contributions! 16 Anne's husband, Frankie Lavern Cochran "Bud"
Posting more facts than fiction, as many seem to post legend, lore and speculation. However, some of that family legend carries a bit of truth, so never discard it completely. I have thoroughly enjoyed my visits with family and meeting new relatives on the internet, especially those who knew my parents as children and have so much to share J Few of my mother’s kin still exist but my father’s lineage is so extensive, but then I think that perhaps others who know of my mother’s lineage may contact me yet, once they see the mess I have created on the internet. One day I picked up the phone book and started calling around, some may have thought I was off my rocker just a bit, but I did locate one lovely lady named Nancy in my mother’s lineage, who had spent many years researching our great grandfathers from Alabama, into Georgia and up the coast, so it turned into a fantastic conversation, as I learned that I was on the right track with this research. I do wish that mother had known this wonderful person. Yes indeed it is a mess but I promise this will get better and thus far it has not been too complicated, as many servers have their own little format to make free webpages and never seem to vanish, so I’ve been quite fortunate that my work continues to linger in cyber space ! Most of this is old photos uploaded to share but also to preserve. I have been printing them out as I go along, and creating a huge notebook for my children to browse. A huge piece of the puzzle is figuring out the names of women; those unknown grannies can drive us up the wall ! However a few of them are now known, some I found on census records, so this stuff is finally making some sense and even though it is a mess, it is all here ! Frankie Cochran married Annie Lee Alice Carter in 1951; his parents were Luella Ellen Coonfield and Frank Delbert Cochran of Chetopa KS. Anne's parents were Alice Emma McClain and Cecil Earl Carter who had three children. Grandpa Cecil Carter married Emma Alice McClain; His parents were Anna Lou Stone and William Franklin Fenn of Macon AL and I was so excited to order Grandpa Fenns death certificate to learn more about his parentage and that he was born in Tuskegee. which was Creek Indian Territory. Cecil's brother was Wm Frank Fenn Jr of Coosada who's land was sold to build a new school by Frank's son, Bob Fenn. Bob was once the principal at Robinson Springs School who was previously married to a Martha Cobb. Bob's sister was recently found living in Millbrook Alabama and I had a wonderful visit with her. The Fenns all had a beautiful dark complexion and dark brown eyes. Grandpa Cecil was described on his military discharge as a tall, dark ruddy complected man with dark brown eyes. Bob says that his fathers home in Coosada caught fire once and most photos and documents burned. I do remember my parents visiting Uncle Frank in Coosada. Uncle Frank's brother, Emmett Marvin Fenn, had left something to my mom when he died. Grandpa Frank D Cochran married Luella Ellen Coonfield; his parents were Clora Jane Miller and Jacob Benjamin Cochran. The Coonfield sisters all had long black braided hair and dark brown eyes, just like Clora and these women smoke corn cob pipes~~ Other researchers write that Clora's mother, Mary Clara Parker Miller was a medicine woman among the indians. Great Grandpa William Frank Fenn married Anna Lou Stone in 1893, divorced about 1900 and both remarried. His parents were Emiline Harrell and John Fenn of Georgia who moved into Tuskegee. Her parents were Mary Ann Hendrick and Augustus M Stone. - Augustus was born in Alabama to Sarah Davis and Benjamin Wilburn Stone = Benjamin's father was Michael Stone from Maryland who had married a Polly Wells in Putnam Georgia. It is unknown if he was related to Catherine Stone in the Brooks/Ballard ancestry. Great Grandpa Charles Allen McClain married Emma Lorena Bozeman in 1908 His parents were Elizabeth Broadway and Josiah Marion McClain. Her parents were Alice Lorena Stephens and John Thomas Bozeman. Charles was a small man, a farmer who cleaned the church and also made caskets as the epidemics took so many. Great Grandpa Jacob Benjamin Cochran and his second wife Clora Jane Miller came from Iowa to Kansas about 1890 and had Frank Delbert Cochran. On the 1880 census we see that Jacob has a ten year old grandson named Frank but he only had six daughters at the time so this is a big mystery and we have no clue what happened to that Frank. Great Grandpa Benjamin Wallace Coonfield married Lattie Cedonia Little in 1891; his parents were Martha Frances Young and Benjamin Wylie Coonfield. Her parents were Mary Catherine Crigler and John Wright Little. The Littles and Coonfields were once in Kentucky and migrated into Arkansas. John's father, Hiram Little, moved to Bosque Texas and remarried and had a new family. John Little said that he was Cherokee and his beautiful black haired daughter, Lattie Cedonia Little told her children that she was Cherokee. Fortunately I have met many new cousins on the internet researching this line ! They say the Coonfields were all very dark complected, with black hair that had a blue/green shine. Kentucky `1850 census shows the Criglers as free persons of color?? they were not white and not black eh? Our photo of grandma Crigler indicates she could have been an Indian. John Wright Little's mother was Nancy Catherine Wright who married Hiram Lucius Little. Catherine's parents were Catherine Georgia Weatherford and John C Wright who were married in 1811 Charlotte VA. Catherine Weatherford's father was Charles Weatherford but not at her wedding so was he in Alabama at that time? Daddy's aunt writes that John Little's son, or Uncle Bill, looked just like an indian man who visited often on his horse. She also writes that John's daughter, Lattie Cedonia Little Coonfield, cooked the best skunk meat in town. Great Great Grandpa Josiah Marion McClain left his first wife in GA and came to Alabama in the Civil War and married Elizabeth Broadway in Ramer Alabama and had our Charles Allen McClain. "Bettie Broadway's" family came from South Carolina. Great Great Grandpa John Thomas Bozeman married Alice Lorena Stephens in Ramer Alabama and had our Lorena Emma Bozeman. John's parents were Nancy Jane Anderson and Peter Edward Bozeman, son of William Henry and to William's father Peter Boseman who was married to Sarah Brown. I have also found that Sarah came to Alabama with Peter, where many speculate that she died in SC. Cochran, Jacob, said his ancestors came from Scotland and he was born in Ohio while his father was born in PA.
Millers came from Ireland, where Reverend Alexander Miller is found in Rockingham Virginia and Charles Weatherford is found in Charlotte VA in the 1810 census just one year before his daughter married John C Wright. Near Charles Weatherford is Patsy Weatherford with children and she could be the Polly Jones Weatherford that we have been looking for. The Weatherfords had a lot of Indian Roots. and Kentucky around 1800. They began to move west and some served in the wars and some searched for gold. Jacob had gone to California in 1849 with five brothers but he only returned with socks full of gold dust. Jacob Cochran apparently became an apple farmer in Kansas and he was the first homesteader there in Hill City. However, Jacob and his first wife Mariah White and six daughters first moved to Iowa, where Mariah is buried and where he met Clora Jane Miller. Charles McClain married Elizabeth Moon in VA and they moved into the Carolinas and we find them on the Spartanburg SC census. Their son Josiah was born there and he married Nancy Wood and had James W McClain. James married an Anna and had a son called Josiah Marion McClain. John Fann of England married Mary Stone in VA and their children moved south as some were Indian Traders. It is unknown if Mary Stone is related to Michael Stone above or to the Thomas Stone who signed the Constitution but this is what makes our genealogy even more exciting. The Bozemans/ Bosmans are found in the 1600s Maryland and VA where they got together with the Stephens, Andersons, Brack, Sellers and even a Doty which connects us to the Mayflower. There are many stories writen about our Edward Doty who attended the first Thanksgiving. and married A full blood Cherokee, before coming to Alabama. Some researchers suspect he was Johann Stephans of Germany but we will never know. Captain George Little of Scotland was in the American Revolution in South Carolina and went to Kentucky about 1800 with his second wife. His son Jonas married Betsy Douglass, his step sister, and had Hiram Lucius Little and another son Douglas Little. Hiram and Douglas both married granddaughters of Charles Weatherford. Marriage 1 Martha b: ABT 1807 in Thomas Randolph Carter signed the estate documents and married Jesse's daughter Lacy. Re: Annie Stone 1881 Alabama to Georgia ? someone is about 70 years old in this household if you browse across the page and look at the ages. Cecil was Native American, his Fenn family in Tuskegee, Macon, AL former Creek Territory. 7. Coopers in Chambers County AL in Creek Territory. Chambers County, Alabama…Chambers County was created by an act of the Alabama General Assembly on 1832 Dec. 18, from Creek Nation territory. It is located in the east-central portion of the state, and is bounded on the east by the Chattahoochee River. The county is named for Henry Chambers, a U.S. Senator from Alabama (1825-26). The location of the county seat was selected in 1833 and the town of LaFayette was built specifically for that purpose. Authorities: Acts 1831-32, p.9. Owen, Thomas McAdory. History of Alabama and Dictionary of Alabama Biography. Chicago: S.J. Clarke Publishing Co., 1921. The treaty with the Creeks stipulated that the head of each Indian family was to receive 320 acres of land and the chiefs 640 acres. Most of the Indian land ended up in the hands of white land speculators. Most of the Indians were forced out of Chambers County after the Creek War of 1836-1837. Some of them ended up in Randolph, Macon, Tallapoosa or Talladega counties for a short while, before finally giving up and heading further west. Some of the Indians managed to stay in Alabama by denying their Indian blood, claiming to be Black Dutch or Melungeun. Copyright © 2006 Kathy Cochran. All Rights Reserved.